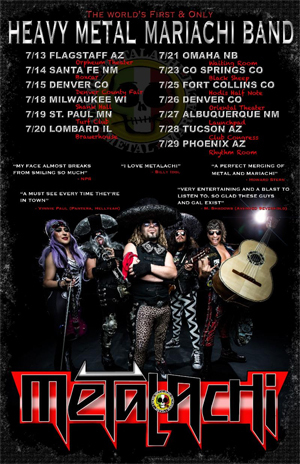 METALACHI - the world's first and only heavy metal mariachi band - are announcing even more upcoming tour dates hitting the western and central U.S. this summer! The new group of dates will begin on July 13 in Flagstaff, AZ and hit several major cities, coming to a close on July 29 in Phoenix, AZ. Hailing from Hollywood, CA via Juarez, Mexico, METALACHI is a musical/comedy stage show that somehow seamlessly blends the world of SPINAL TAP and CHEECH & CHONG into an over-the-top stage spectacle. The band is comprised of a five-piece ensemble of classically trained mariachi musician siblings, that have been fused together with the power of heavy metal. Fans can expect an unlikely meshing of metal classics from artist such as METALLICA, SLAYER, OZZY OSBOURNE and more with traditional mariachi standards from the likes of Vicente Fernandez and Mariachi Vargas de Tecalitlan... all played with traditional mariachi instrumentation but with a stage show that strays far from traditional! METALACHI has garnered worldwide acclaim for their unique brand of raucous humor and innovative musical mastery, quickly amassing a loyal and diverse fan base of music lovers in addition to gaining praise from music royalty such as Dave Lombardo (SLAYER), Vinnie Paul (PANTERA, HELLYEAH), Eric Wilson (SUBLIME), M. Shadows (AVENGED SEVENFOLD), Billy Idol, and Howard Stern along the way (fun fact - for the past five years, SUBLIME has used METALACHI's debut album Uno to time their set changes, blasting the entire album over the PA at their live shows). METALACHI has been featured on America's Got Talent, CNN's Great Big Story, Rolling Stone en Español, BBC's Outlook via NPR, Huffington Post, and National Geographic, and their music has been heard on FX's The Bridge and in a new TV commercial for DirecTV. METALACHI has been named one of the 10 best Mexican Metal Bands worldwide by OC Weekly, was named #4 on a list of the top 20 tribute bands based in Los Angeles by LA Weekly, andwas voted as one of the best live shows in Southern California by Examiner.com.